Transparency Market Research in one of its recent research reports points out the global enteric disease testing market to be fragmented with the presence of numerous small players that operate within regional markets. The market, however, features the dominance of a handful of large players that operate globally. Mergers and acquisitions to expand geographical outreach and to enhance research expertise is likely to be the key growth strategy for players in this market in the upcoming years. Prominent players to name in the market include Trinity Biotech plc, Bio-Rad Laboratories Inc., Biomerieux SA, CorisBioconcept SPRL, Cepheid Inc., Biomerica Inc., Alere Inc., Meridian Bioscience Inc., Quest Diagnostics Incorporated, and DiaSorin. As per the TMR report, the global enteric disease testing market stood at a valuation of US$3.7 bn in 2017. Expanding at a CAGR of 3.6% from 2018 to 2025, the opportunities in the market is likely to translate into a revenue of US$4.9 bn by the end of 2025. By disease indication, in 2016, bacterial enteric diseases held almost 58.5% of the overall market. Geographically, North America and Europe hold dominance in the enteric disease testing market, with the two regions collectively accounting for leading share in 2017. Europe is likely to remain at the lead in the enteric disease testing market over the forecast period closely followed by North America. Enteric disease testing practices have witnessed a sea of change in the recent past with integration of technology and availability of advanced testing equipment, especially in developed countries. This, along with advancement in medical research has led to uncovering about the wide array of pathogens responsible for enteric diseases. This has further helped to devise preventive testing methodologies to keep enteric diseases at bay. In addition, strong pharmaceuticals industry in developed regions such as North America and Europe have been instrumental in the growth of enteric disease testing market. The rising tourism in relatively underdeveloped countries of South America and Central America has contributed to the rising prevalence of enteric diseases in developed countries of North America and Europe. Travelers from developed countries travelling to these destinations tend to carry back germs that may lead to enteric diseases due to lack of hygiene standards in resource-poor countries. This is boosting the enteric disease testing market in developed countries. Enteric diseases account for a significant burden on healthcare systems for diagnosis and therapeutics of enteric diseases. The growing prevalence of enteric disease particularly in resource-poor countries has necessitated preventive testing to minimize expenditure for both healthcare provider and healthcare receiver. On the flip side, insufficient medical research infrastructure in developing countries is preventing testing methodologies to be devised for the masses in populous countries. 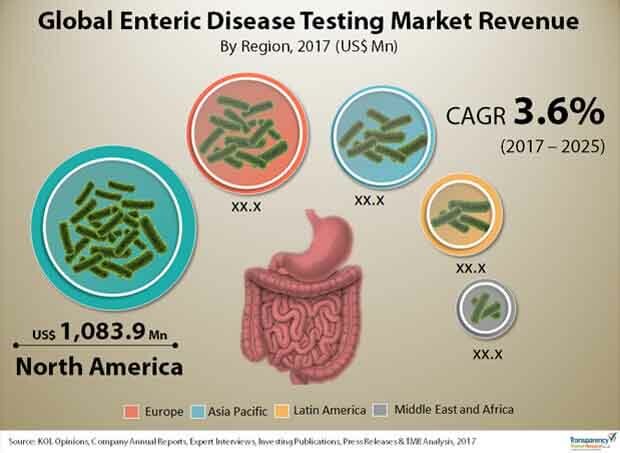 Lack of resources and lack of public welfare programs in poor countries of Asia Pacific and Middle East and Africa is holding back the growth of enteric disease testing market in these regions.